Compression socks are a common among crossfitters. However, how do you choose a pair? In this article we’ll cover the top characteristic to look for in a pair of compression socks for crossfit and then review some of the top compression socks to consider purchasing. First, let’s understand the purpose of compression socks. As outlined in this great article, compression socks are designed two have two main benefits: increased blood flow and decreased muscle vibration. These two benefits generally lead to improved recovery and decreased soreness. We all know that the demands of crossfit are tremendous, and therefore any edge we can get on recovery or soreness, will be jumped upon by many. After all, the whole point of a compression sock is to provide compression! And not all socks are made equal in this regard. In fact, many so-called compression socks do not provide adequate levels of compression, so it’s an important point to consider. You’ll also want to consider whether to choose graduated compression or constant compression. CrossFit workouts are intense! We put out our gear through intense amounts of stress. And the last thing you want is for your compression socks to fall apart or deteriorate quickly. Therefore, it’s important to take quality into consideration when purchasing a pair. Wicking materials pull sweat and moisture away form the body, keeping you dry. Given the intensity of WODs and the amount of sweat generated, it’s a good bet to choose a pair of compression socks made from wicking fabric. Another consideration to keep in mind is the style. A viable alternative to the standard compression socks is to get a calf sleeve. This will generally provide enough compression on your core muscle (the calves) to get a full effect of compression. Using a calf sleeve will allow you to wear your normal socks underneath which is something a lot of people find beneficial. So, now that we’ve covered the key characteristics to consider when purchasing a pair of compression socks, let’s go through some of our top picks. First off are Reebok CrossFit compression socks. Since these are the only socks licensed by CrossFit, they are the only ‘official’ CrossFit compression socks. That said, there are plenty of other brand compression socks that are suitable for use in crossfit, and we’ve featured a few of them below. 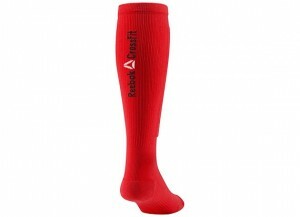 A key feature of Reebok’s CrossFit compression socks are the graduated compression. This means that the compression level is tightest in the lower part of the sock (near the foot) gradually becoming less tight as the sock moves up the leg. The below diagram shows what graduation would look like in a full leg compression stocking. The below diagram demonstrates what graduation compression would look like on a full length stocking. 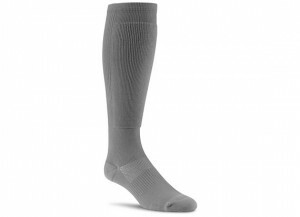 Graduated compression means that there is greatest compression at the bottom of the sock. Compression decreases as the sock moves up the leg. Another great feature (and something unique to Reebok CrossFit compression socks) is that they have a padded front panel. This provides protection when doing deadlifts, rope climbs, or other movements where you can scrape your shins. I don’t think they’d give adequate protection if you misjudge your box jump though! Notice the padded section on the shin. This provides additional protection from scraping during deadlifts or rope climbs. Click on the picture to check them out. They also have arch and ankle support which provides muscle stabilization during workouts. The best thing about these socks? The price! At only 16 dollars per pair, they’re actually one of the cheapest compression socks on the market. This is unusual, as generally Reebok CrossFit gear is more expensive than the non-crossfit brand equivalent. They come in plenty of colors as well. 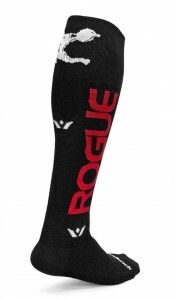 When looking for any gear for CrossFit you can’t go past Rogue. They have their own branded compression socks, located here. What makes these socks different is the fabric. They’re made from Olefin fibres, which are so light weight and fast drying that they retains less than .01% of their weight in moisture! Olefin also has special qualities that resist deteriation from chemicals and perspiration. A great little fact about Olefin is that it’s inventors won the Nobel Prize for it. This was in large part because of Olefin’s environmental impact: the manufacture of Olefin has a less negative environmental impact than alternatives and is easy to recycle. The material is also anti-microbial, which means they won’t smell as much. An essential factor for socks you wear during a WOD! These socks are actually made by Swiftwick, then branded with Rogue. So if you like the product features, but don’t like Rogue branding, you can check out the full range of Swiftwick compression socks on Amazon, here. 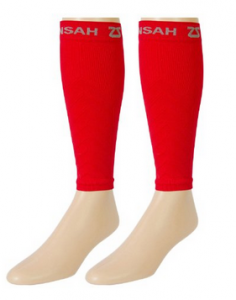 With Zensah you can either go for the full compression socks, or for a calf compression sleeve. If you dig around the internet, you’ll find that Zensah are one of the most highly recommended compression socks around, particularly by elite athletes. Zensah markets their compression socks as “ProGrade” and judging by the reviews, they are. In addition to the superior levels of compression, another core feature is the built-in arch support, which Zensah claims to assist your legs last longer during endurance runs. Another great feature of Zensah compression socks are that they come in many differing colors. If you want to make a statement at the box, then try bright green or argyle! They come in a wide range of colours, and are made from wicking and antimicrobial fabric. Just like compression socks, the compression sleeves provide superior compression, aiding athletic training and recovery. The main benefit of the sleeves is that you can wear them with normal socks. Potentially this means that you don’t have to wash them every time you use them, whereas you would need to wash your socks! A downside of the sleeves is that they don’t have the in-built arch support. 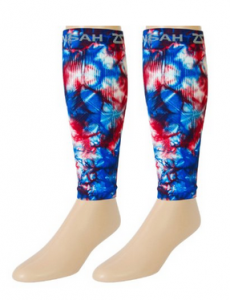 Click here or on the pictures above to check out the Zensah leg sleeves on Amazon! 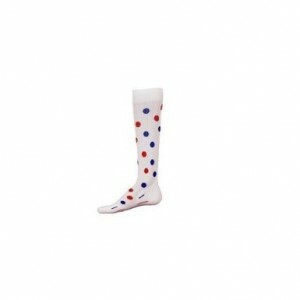 As is standard for compression socks, these socks are moisture wicking, and have very good compression levels. Reviewers tend to be very happy with these, and it has a 4.8/5 star rating on Amazon. The compression is ‘graduated’, what this means is that the compression is tightest around the feet and gradually become less tight as the sock moves up your leg. The model most useful for CrossFit are the Compression Race Sock. 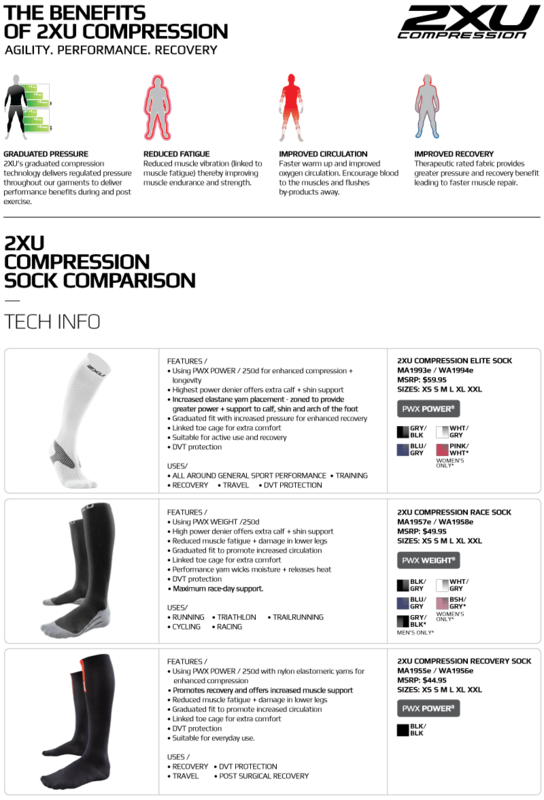 The features of the various types of 2XU compression socks are outlined in this table. Check them out by clicking here. Finally, we have the CEP compression socks. 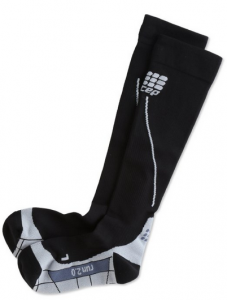 Similar, the 2XU socks, customers are very happy with these socks, giving them well over 4.5/5 on amazon. One of the unique things that CEP has done is rigorous research on the benefits of their compression socks, including reduction in shin splints, calf craps, Achilles issues and pulled muscles. 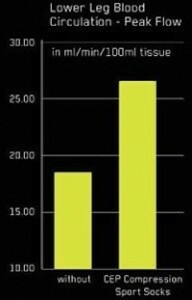 Below are the results of one such study showing the significant increase in lower leg blood circulation when wearing CEP compression socks. One of the big differentiating factors is that CEP does not have graduated compression, but rather has compression all over the foot and lower leg. Some feel that it does not fit them anatomically as well as socks with graduated compression. Finally, let’s consider what men and women might look for in compression socks. The anatomy of a man’s leg is pretty much the same as a woman, so the sock structure itself is going to be the same. What differs is the design. Women crossfitters might like to consider these pink or orange compression leg sleeves from Zensah. We’ve shown you the key characteristics to look for in compression socks for crossfit, as well as providing reviews of the top five brands. Let us know your experiences. Did we miss out on an important brand? Have you found compression socks useful for crossfit? Or are they more hype than function? Next post: Best Shoes for Zumba – We Review the Top 5! Previous post: The Best Crossfit Shorts: We Review the Top 5!